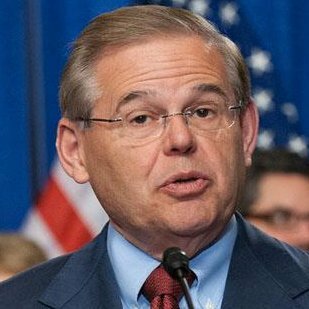 Bob Menendez has refused to provide voters with positions on key issues covered by the 2018 Political Courage Test, despite repeated requests from Vote Smart and voters like you. Prohibit "partial birth" abortions except for life and health of mother. j) Prohibit non-U.S. citizens from making contributions to federal campaigns. X e) Increase funding of federally-sponsored drug education and drug treatment programs. X f) Increase the minimum wage. X b) The federal government should continue affirmative action programs only if such programs do not include quotas. X d) The federal government should prosecute cases of discrimination in the public sector. X e) The federal government should prosecute cases of discrimination in the private sector. X f) The federal government should include sexual orientation in its anti-discrimination laws. X f) Support creation of more charter schools where teachers and professionals receive authorization and funding to establish new schools. Raise standards; provide resources for those willing to meet these. Reduce class size. Undecided 2) Do you support amending the U.S. Constitution to guarantee the right to religious expression and voluntary prayer in public places, including schools? U.S. should take unilateral military action against Iraq if it can not acquire an internal effort. Yes 5) Should the U.S. recognize and extend full diplomatic relations to Taiwan? X c) Require the Immigration and Naturalization Service to reduce to six months the time between applying for citizenship and taking the oath of allegiance. A strong morality is built on strong families and communities. I work to build these institutions by supporting quality education, fair wages for all workers, economic aid to hard-pressed areas, community policing, and child care. I fight for working families because the family is the basis for sound moral teaching. X e) Invest a portion of the budget surplus into the Social Security trust fund. Since Social Security taxes are 98% of the projected Federal surplus- use it for SS. Undecided 2) Do you support replacing the U.S. income tax structure with a flat income tax? Undecided 7) Do you support granting the President "fast-track" authority? Encourage work and personal responsibility, while maintaining a safety net, especially for kids. I will continue working to bring economic development funding to my district, as I have already done to modernize our job-supporting Port, fund the Weehawken Ferry and Hudson-Bergen Light Rail, and revitalize Jersey City Waterfront and MLK Drive, as examples. I will continue fighting for our children, working to pass my Drug Elimination and Justice Act to make our schools safer, my School Construction bill to modernize schools, while raising standards and lowering class size.